In April, I received the Silver Lining Award from writer and freelance editor Helen Ginger. Her blog, Straight from Hel, offers advice and information about writing and writers, books, publishing–there’s “God’s plenty” here for the writer, aspiring or experienced. Helen posts daily, and she also contributes to The Blood-Red Pencil, another blog I follow. The Silver Lining Award was a surprise. I couldn’t wait to display it on to write is to write is to write and to pass it on to other bloggers. But I ran into an obstacle. I didn’t know how to display it. I knew to use a widget, but how to grab or capture or whatever to get the proper code to put into that widget was outside my realm of experience. I knew I had to get the image to my computer. I knew I wasn’t supposed to link to the image on Helen’s blog. I knew I had to have its URL. Actually, all of this was inside my realm of experience, because I’d done something similar a couple of months before. I had just forgotten what and how. The obvious thing to do in such a situation, after googling for instructions and increasing the confusion, is to ask for directions. I don’t ask for directions. Anyone who has ever taken a road trip with me will vouch for that. When I get lost, I drive around until I find what I’m looking for. When lost in cyberspace, I click around. So I clicked for a couple of hours. After engaging in mind-clearing activities, I clicked some more. I took a break and wrote a blog post about silver linings. I reminded myself this was not rocket science; it was a simple procedure. The next day, I clicked again. After skipping a few days, I clicked some more. I went to a conference. I spent a week recovering from the conference. I clicked. I fell into the Slough of Despond and decided I would never write again. I crawled out and decided I would. The entire time, both clicking and non-clicking, I was straining to dredge up the technical details of that brief moment of competency only sixty days past. But the truth is–and now I’m exposing my darkest secret–I like clicking around. I have such a feeling of accomplishment when things fall into place. I bump into all kinds of serendipities along the way. And I’m too ornery to give up. I can’t help that last thing. It’s genetic. Sometimes it’s also a failing. I’m working on it. 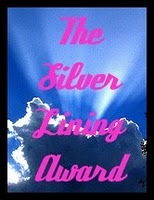 Anyway, I finally discovered how to display the Silver Lining Award on my blog. Laboring along the road to discovery was an accomplishment. It was, in fact, a silver lining. Ladies, thanks. You’re all silver linings to me. Helen Ginger blogs about The Name Game today on The Blood-Red Pencil. 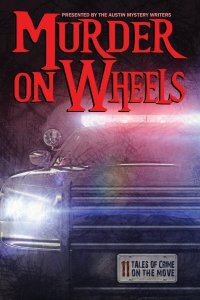 On Straight from Hel, she interviews author Jean Henry Mead. Thank you, Pat. I think often of you off on your travels. Wow, thanks Kathy! I’m deeply honored. And I so understand about your compulsion to click around. I enjoy the same affliction. That’s a primary reason why it’s taking me a hundred months to get my blog migrated to WordPress on my own site. Migrating a blog? That sounds scary. I wouldn’t ask for help with that–I’d ask someone to do it for me and then leave the room. Kathy, you are funny. Just ask! That’s the only way I know how to do thinks like copy pictures. I asked. For all the other awards you get, right click and click Save Image As. You deserve the Silver Lining Award because you work and search until you find the answer/silver lining. Thank you Kathy – and congratulations on your own award! I loved this post it was just so funny! You most definitely are a silver lining! You’re welcome, Linda. And thank you for allowing me to visit your Velvet Room. It’s a lovely place. You are definitely a silver lining in my life. You respond to and discuss what I have to say. You make me feel noticed. Thank you for the award! I’ll do my best to live up to it, and I’ll pass it along as well. Online friends like you keep me going! Now, my confession. I also hate to ask for help. Luckily, in this type of situation, I would normally ask daughter Becca, as she is computer guru extraordinaire. However, she decided a long time ago not to just give me answers. She supplies me with the tools I need, the reference or whatever, to accomplish the task myself. She grew up being told by her mother that it means more and you retain it better if you do it yourself. She learned well, but the first time she turned the tables on me, ouch! But she knows well the satisfaction and empowerment of figuring it out without direct help. In fact, I do believe she’s one of my “silver linings.” She’s one of the main reasons I like to blog. Thanks, Susan. Re: that toddler–I’m told that’s exactly what I said in my much younger days: “Do it by self!” Do you think it’s too late for us to change?